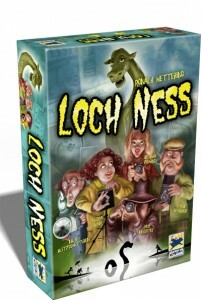 Two games about Loch Ness were released at this year’s Spiel in Essen. This one is by Ronald Wettering, who designed Lifeboats – a great game where players vote each other’s people out of sinking life boats. 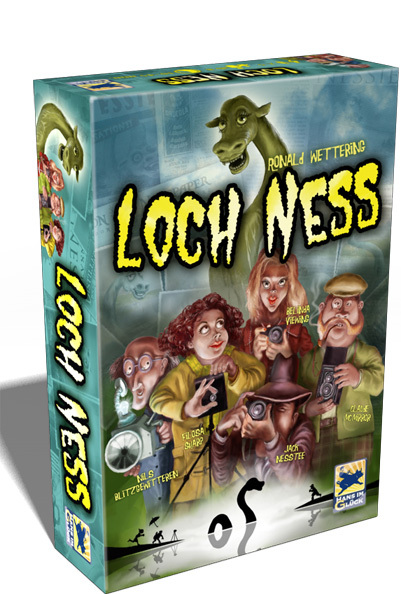 With such a great (and humourously vindictive game) in his repertoire, I was automatically interested in Loch Ness. Players have 3 photographers (numbered 3, 4 & 7) who are trying to take photos of the Loch Ness monster (Nessie). The better the position when Nessie appears, the more victory points (VPs) you will score. Each round, 3 players select one on their Move cards (numbered 1 to 5) placing it face-down. Then, players take turns selecting a special ability such as: Look at a face-down Move card, 3 photographer worth 9, use different set of Move cards, move a photographer after all other movements (which can be moved where other photographers are), etc. Next, players must move 1 of their photographers, and then may move one more of their photographers, to any free location around Loch Ness. When all photographer movements have been made, the 3 face-down Move cards are revealed and Nessie is moved a number of spaces clockwise around Loch Ness equal to the total of the Move cards. All photographers on the group of islands at Nessie’s new position score points equal to their photographer value. Photographers directly next to Nessie’s space get +1 VP plus they take 1 (sometimes 2) photo cards which show Nessie’s head, middle or tail. When taking a photo card, a player can take one of the 3 face-up cards or the face-down card on top of the deck. At the end of the game, full sets of 3 different photo cards are worth 10 VPs, pairs of different cards 5 VPs, and single cards 1 VP. When Nessie is moved a small Nessie is moved along the score track too. When it passes 65, the game ends. The player with the most VPs wins. Whilst some information is known, watching which photographers opponents place where can give you information about the numbers that could be on their cards; however, players can use this to misdirect others too. One of our players placed one of their photographers in a location a long way from Nessie so we all read into that he had placed a high number Move card but then he placed his (most valuable) photographer only a short distance away. It turned out his first move was a bluff to put us off the scent and it worked well. Once someone performs a bluff, the game gets interesting as players start to bluff and double-bluff, guess and double-guess. We played with one of the two variant rules so that, once played, you could not use the same Move card again until you had used all the cards in your hand (or used the additional special action that lets you pick up all your move cards). We also played with used Move cards being open information so that the game wasn’t easier for people with better memories. This worked really well to add to the thinking involved as it meant you could rule out some cards – this meant positioning your photographers wasn’t predominantly guesswork. The extra abilities were interesting although I felt a couple were less useful compared to others. The ability to look at one of the face-down cards was unsurprisingly the most used by far. However, as first player changes each turn, the order in which players select abilities alters too so it’s fair. As we played, some powers became more important/useful such as using the special set of Move cards instead of your own when you are low on cards in your hand because it makes it harder for other players to estimate Nessie’s move. I like how each player has a slightly different perspective of each round (as most players know the value of a different Move card). Each time a player placed a photographer, there were mutterings and ‘hmmms’ from the other players as they all tried to read each other’s moves, especially because of possible bluffing, and recalculate their predictions based on any new information. I’ll be interested to see how the game plays with 2 players. Whilst 3 cards are required to move Nessie each turn, it’s good to see there are rules for a 2-player game too where the 3rd card is randomly drawn from a separate set of cards. Loch Ness is very different to the designer’s previous game (Lifeboats). It’s not a very deep game, but it’s a solid light Eurogame which is fun, quick and both new and experienced gamers can enjoy it. Some experienced gamers will find it doesn’t have enough meat or certainty in its gameplay, but it’s a good change of pace from serious games and the psychological aspects are the most entertaining part. This entry was posted on Tuesday, December 21st, 2010 at 10:12 am	and is filed under Board Game Review, Board Games, Essen Spiel 10, Loch Ness. You can follow any responses to this entry through the RSS 2.0 feed. You can leave a response, or trackback from your own site.